Charming by day, surprising at night. By day it is a historical monument and privileged viewing platform, chosen by tourists from around the world to admire the historic centre of the city and its surroundings from above. At night it is an exclusive location available to private individuals, companies and institutions to host events in an elegant living room suspended over the city lights. AGEC Eventi offers a double life to the Torre dei Lamberti and a double opportunity to the fortunate few who come to Verona and can experience the Tower by participating in the many events with it as the protagonist. Aperintorre: the city’s most exciting and panoramic aperitif. 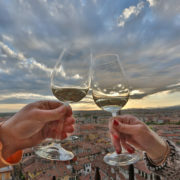 When in Verona an aperitif is a must, making a toast at 84 meters in height, on a beautiful terrace suspended over the lights of the city, is a unique opportunity. Look out for the next Aperintorre evening (you can enjoy a glass of wine and appetizers at the top, at early evening light) if the date is approaching book now toast with a spectacular view eventi@torredeilamberti.it , and hurry as places are limited! Torreventi: a location that is above everything else. An exclusive lounge, reserved for your guests in the city’s tallest historical monument. Perhaps not everyone knows but in the Torre dei Lamberti it is possible to host a high visibility event that is spectacular. Contact us at eventi@torredeilamberti.it to get information and immediately book the city’s top location.